Today's entry is about loss and moving on. Many of you remember what happened to our Christmas ornaments a few years ago, but the story is here if you are new to the scene. I think my reaction to the whole destruction was due to a number of things. I had just lost and given up so much that the loss of all of our Christmas ornaments was the straw. It was easier to morn and weep over the loss of the ornaments than it was to morn all the loss and disappointment leading up to that moment in time. But there comes a time where you have to move forward. You have to pick up the pieces and rebuild or some times you just have to start over. Sometimes I wonder what would have happened if I had been more adamant and forceful in my refusal to move in with Chris's mom. Would we still be living at the old place? What would we be like today? Would it change anything? I know now that the answers to those questions don't even matter; that I don't even care. Chris and I have been collecting new Christmas ornaments over the last couple of years. 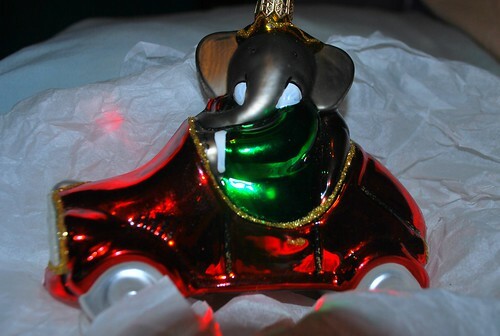 Last week, we are able to find a replacement for an ornament that had been lost. And this year there is talk of actually setting up a tree. It may end up looking a little sparse, but that just means there's more room for a little more love.